At the top of the list in the second round is Grandmaster V Vishnu Prasanna, who got the better of nearly 200-points above rated Tamir Nabaty of Israel. 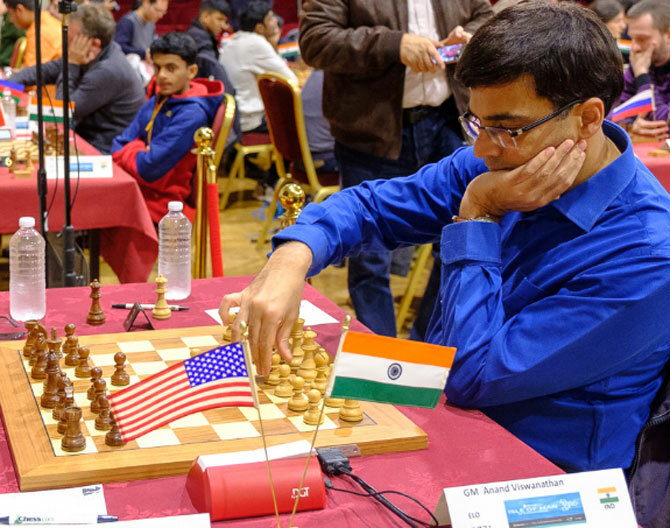 Former World champion Viswanathan Anand struggled for the second day running as he was held to a draw by almost-retired Robert Hess of the United States in the second round of Isle of Man International Chess tournament in Isle of Man, United Kingdom, on Monday. Anand was on the verge of losing to 13-year old Raunak Sadhwani in the first round and had to find some fine manoeuvres to stay in the game. In the second round also, the Indian continued to hunt for his form and again employed defensive approach towards the business end of the game. Hess is a noted commentator and was the appointed coach of the US women's team earlier this year for the Chess Olympiad. Anand faced the French defense with white and could not get much and it was a tiring rook and pawns endgame, with a pawn less, that the Indian had to defend a long time before salvaging a draw after 78 moves. Meanwhile, upsets continued in the tournament with Indians involved in making most of the opportunities. Joining the celebration is Grandmaster-in-waiting Harsha Bharthakkoti, who put it across compatriot and higher ranked S P Sethuraman in what was probably the game of the day. Harsha was at his best in attacking Sethuraman's king right from the word go and capped it with a brilliant queen sacrifice that will certainly find its way in many future tactics books. Vidit Gujrathi also apparently made a contribution to the tactics books at the expense of fellow Indian Debashish Das. Gujrathi was in top form in bringing all his pieces together against a hapless black king. Hungarian Peter Leko had won a very difficult endgame against Tania Sachdev in the previous round but found young Grandmaster R Praggnanandhaa a much tougher nut to crack. The game ended in a draw as the former World championship candidate could not make any progress. Praggnanandhaa's sister Vaishali also had her moment of glory as she played out a draw against former women's World champion Alexandra Kosteniuk of Russia. With seven rounds still to come in the world's toughest open event carrying a prize pool of 130000 pounds sterling, as many as five Indians share the lead in a group of 19. Apart from Gujrathi, Harsha and Vishnu Prasanna, Grandmasters Abhijeet Gupta and Vaibhav Suri share the lead with a perfect score. At the top of the tables, Maxime Vachier-Lagrave of France defeated Abhimanyu Puranik while S Kidambi's dream start hit a setback against Hikaru Nakamura of the United States. Kidambi had drawn with Russian superstar Vladimir Kramnik in the opening round. Abhimanyu Puranik (1) lost to Maxime Vachier-Lagrave (FRA, 2); Viswanathan Anand (1.5) drew with Robert Hess (US, 1.5); Vidit Gujarati (2) beat Debashis Das (1); V Vishnu Prasanna (2) beat Tamir Nabaty (ISR, 1); Peter Leko (HUN, 1.5) drew with R Praggnanandhaa (1.5); Harsha Bharathakoti (2) beat S P Sethuraman (1); B Adhiban (1.5) drew with Helgi Olafsson (ISL, 1.5); Nigel Short (ENG, 1.5) drew with M Shyam Sundar (1.5); Vaibhav Suri (2) beat Daniel Gormally (ENG, 1); Niclas Huschenbeth (GER, 1.5) drew with Prithu Gupta (1.5); Valerio Bianco (ITA, 1) lost to Abhijeet Gupta (2); Raja Harshit (0.5) lost to Wesley So (US, 1.5); Hikaru Nakamura (US, 1.5) beat S Kidambi (0.5); C R G Krishna (0.5) lost to Richard Rapport (HUN, 1.5); S Ravi Teja (1) drew with David Howell (ENG, 1); Rahul Srivastava (1) drew with Alexei Shirov (ESP,1); Jovana Rapport (GEO, 1) drew with Surya Shekar Ganguly (1); Alexandra Kosteniuk (RUS, 1) drew with R Vaishali (1).